Playing with Papercrafting: A Colour Challenge from The Paper Players and a Contest!! 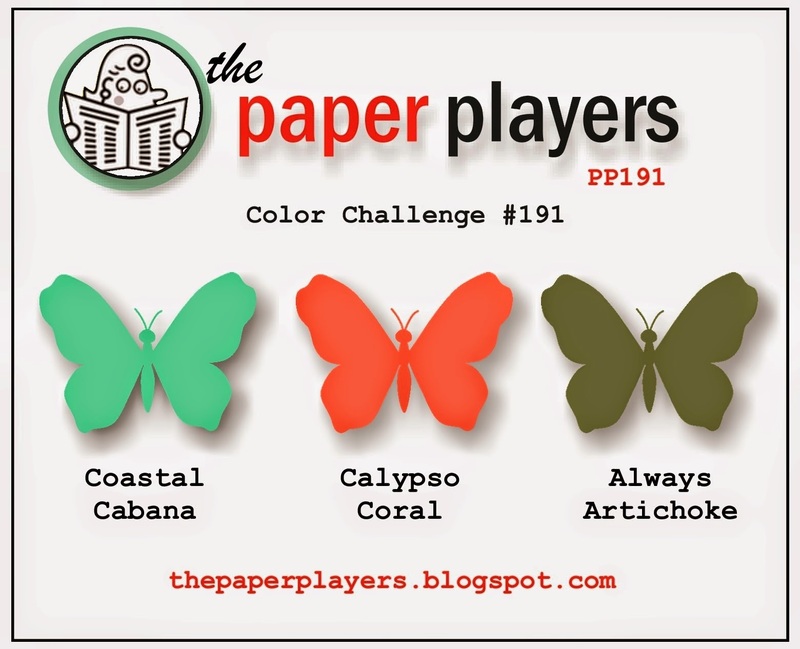 A Colour Challenge from The Paper Players and a Contest!! See what I mean? Well, I was busy making Easter cards for my family, so that was where I started. I thought the Always Artichoke could be grass, using the Fringe Scissors, and the other two would be good Easter Egg colours, but I just wasn't' sure how they would all go together. I used the Occasions stamp set, Eggstra Spectacular, for the Easter eggs and the little bunny with the sentiment and the Petite Petals stamp set for the the flowers. I stamped the eggs in Calypso Coral and Coastal Cabana, punched them out with the Extra Large Oval punch and sponged the edges with the corresponding ink colour. The flowers were inked up in Calypso Coral and Coastal Cabana and punched out with the Petite Petals punch. I did use the Always Artichoke cardstock and the Fringe Scissors to make grass. Sure makes that job quick! The Calypso Coral Chevron ribbon was folded in half and held together by Sticky Strip before mounting it with sticky strip and some glue dots to the grass. The little bunny from Eggstra Spectacular was stamped in Always Artichoke right on to the front panel and a Whisper White Candy Dot becomes his tail! To be honest, I'm not sure which I like better. How about you? Let me know what you think. I wanted to give you a heads up about the Stampin' Up! Retiring Product List. Stampin' Up! is publishing it on Monday, in preparation for a new catalogue coming out June 2. Each year some stamps, paper, colours and embellishments retire and will no longer be featured in the Annual Catalogue and will not be available for ordering. In past years, the stamp sets were available right up until the new catalogue went live and all the other products were only available while supplies lasted. This year, BOTH stamps and other products will only be available while supplies last. That means, if something you like is retiring, you'd better get your order in sooner rather than later! You know how fast those things go! Just for fun, I'm hosting a contest to see how well you can predict which stamp sets will be retired this year. Send me an email (hcooper52@gmail.com) listing 10 stamp sets you think Stampin' Up! will retire this year and the person who gets the most correct will win a GIFT CERTIFICATE with a value of $25.00. This could be used right away or saved until June 2 and used for products from the new 2014-2015 Annual Catalogue! Looking forward to hearing from you. (Open to Canadian residents only.) The contest closes Sunday, April 20 at 8 pm PDT. An adorable card, Heather! You did a wonderful job using the challenge colors. Thanks for playing with The Paper Players! I really do like the striped background paper--it really makes the whole design pop! Great job with the colors... Thank you for sharing with us at The Paper Players! This is adorable, Heather! What great use of the challenge colors. I love the eggs nestled into the grass. Thanks for sharing your creation with us at The Paper Players!